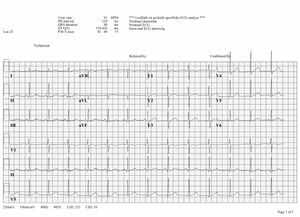 2 How do I begin to read an ECG? 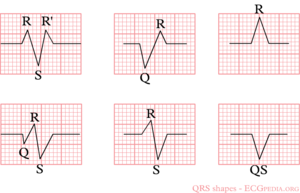 3 What does the ECG register? finally there is a calibration on the ECG, on the beginning of every lead is a vertical block that shows with what amplitude a 1 mV signal is drawn. So the height and depth of these signals are a measurement for the voltage. If this is not the set at 10 mm, there is something wrong with the machine setting. further we have the ECG leads themselves of course, these will be discussed below. Note that the lay-out is different for every machine, but most machines will show the information above somewhere. An electrocardiogram (ECG or EKG) is a registration of the heart's electric activity. 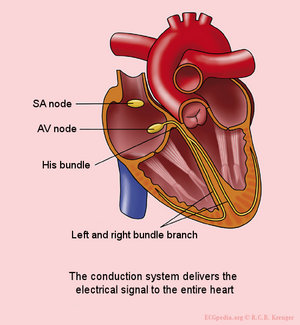 Just like skeletal muscles, the heart is electrically stimulated to contract. This stimulation is also called activation or excitation. Cardiac muscles are electrically charged at rest. The inside of the cell is negatively charged relative to the outside (resting potential). If the cardiac muscle cells are electrically stimulated they depolarize (the resting potential changes from negative to positive) and contract. 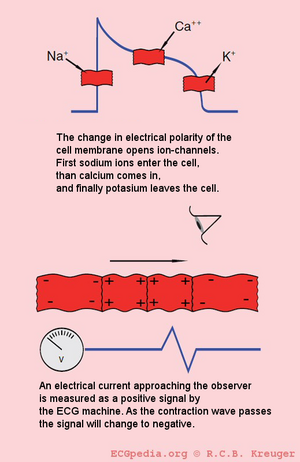 The electrical activity of a single cell can be registered as the action potential. As the impulse spreads through the heart, the electric field changes continually in size and direction. The ECG is a graphical visualisation of these electric signals in the heart. This movie shows the contraction of a single (rabbit) heart cell. The glass electrode measures the electrical current in the heart cell (with thepatch-clamp method). The electrical signal is written in blue and shows the actionpotential. Courtesy of Arie Verkerk and Antoni van Ginneken, AMC, Amsterdam, The Netherlands. During the depolarization sodium-ions stream inwards the cell. Subsequently the calcium-ions stream into the cell. 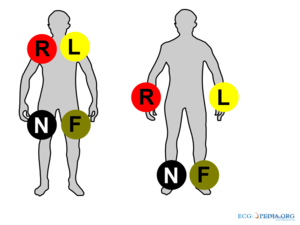 These calcium-ions give the actual muscular contraction. Finally the potassium-ions stream out of the cell. During the repolarisation the ion concentration is corrected. 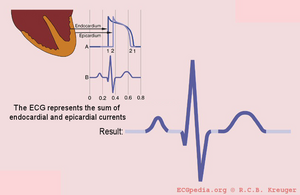 On the ECG, an action potential wave coming towards the electrode is shown as a positive (upwards) signal. Here the ECG electrode is represented as an eye. 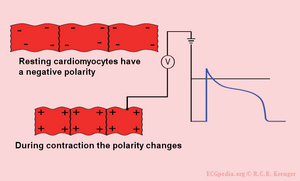 The individual action potentials of the individual cardiomyocytes are averaged. 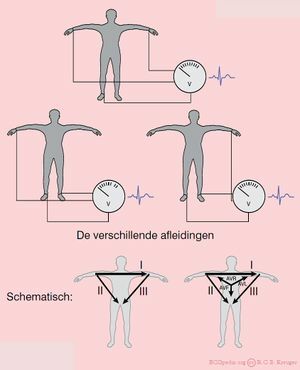 The final result which is shown on the ECG is actually the average of trillions of microscopic electronical signals. 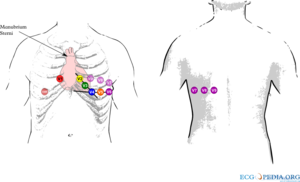 The sinal node (SA node) contains pacemakercells which determine the heart frequency. First the atria depolarise and contract, after that the ventricles The electrical signal between the atria and the ventricles goes from the sinus node, via the atria to the AV-node (atrioventricular transition) to the His bundle and subsequently to the right and left bundle branch, which end in a dense network of Purkinje fibers. 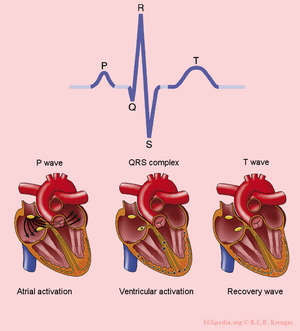 The P wave is the result of the atrial depolarization. This depolarization starts in the SA (sino-atrial) node. The signal produces by pacemakercells in the SA node is conducted by the conduction system to the right and left atria. 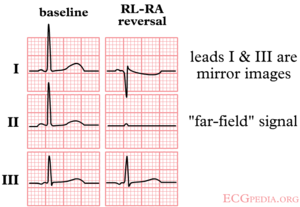 Normal atrial repolarisation is not visible on the ECG (but can be visible during atrial infarction and pericarditis). The T wave represents the repolarisation of the ventricles. There is no cardiac muscle activity during the T wave. 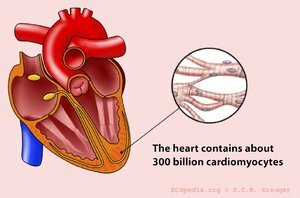 Electric activity going through the heart, can be measured by external (skin)electrodes. The electrocardiogram (ECG) registers these activities from these electrodes which have been attached on different places on the body. In total, twelve leads are calculated using ten electrodes. V4 - placed 5th intercostal space in the nippleline. Official recommendations are to place V4 under the breast in women. Using these 10 electrodes, 12 leads can be derived. There are 6 extremity leads and 6 precordial leads. Right and left arm lead reversal can be distinguished from the (much rarer) dextrocardia by looking at the precordial R wave progression. Sometimes an ECG is not made properly. Mistakes do happen and leads can be switched. Always remain careful to check this or you might come to the wrong conclusions. One of the most common mistakes is to switch the right and left arm. This will result in negative complexes in I, indicating a right axis deviation! Hardly any signal in lead II. Another example of an artefact caused by an electrical appliance. The patients rhythm is regular. This strip shows 10 QRS complexes. 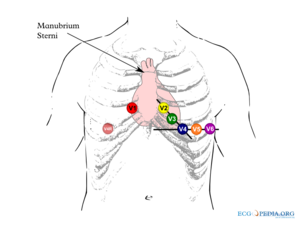 In a right side ECG, V1 and V2 remain on the same place.V3 to V6 are placed on the same place but mirrored on the chest. So V4 is in the middle of the right clavicle. On the ECG it should be marked that it is a Right sided ECG. V4R (V4 but right sided) is a sensitive lead to diagnose right ventricular infarction. Leads V7-V8-V9 can be used to diagnose a posteriorinfarct. It is means that after V6, leads are placed towards the back. See the chapterIschemia for other ways of diagnosing posterior infarction. This page was last edited on 2 April 2010, at 20:06.